After a long hiatus... hello again! They'll be fledging any day now! I live in SantaBarbara, Ca. I joined the NYC Audubon Society and rallied loudly and long following the removal of his nest. I donated; I wrote every single politician, and everyone having to with Central Park to try to mitigate the damage. You people teamed up with various groups to help build the support for the nest Pale Male rebuilt. (with the help of his mates)! This is the first year (after 7) they have hatched any babies. Please do something about the removal of these potentially lethal spikes from the twelfth floor balcony of that building. 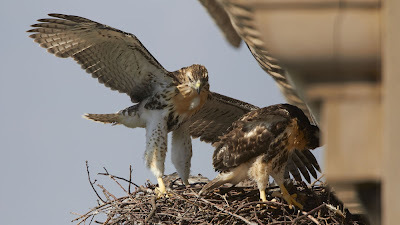 Already both parents have almost become stuck and injured.....The baby hawks could get stuck in them and die. They are easily removed by snipping the plastic cable from the window of the apartment. Thank you for your recommendations about rodenticides. ALL of Central Park is the hunting territory for many hawks. 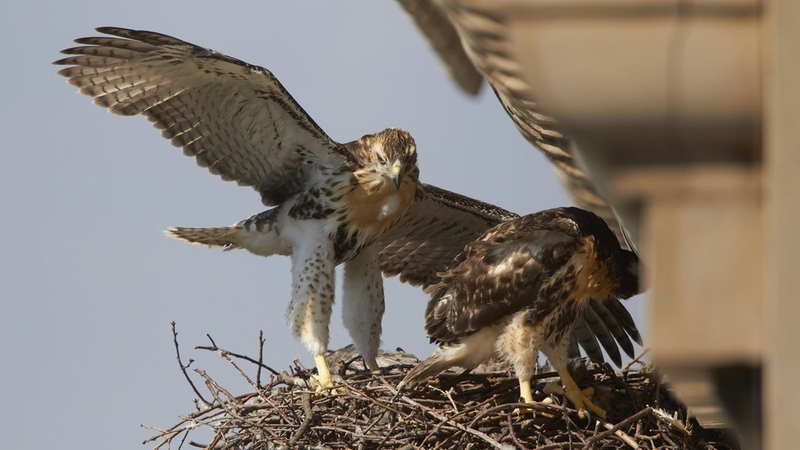 We have already seen many hawks die of secondary poisoning. Please lobby in every way to stop the use of it in Central Park. anywhere in Central Park. The cost of wildlife is just way too high! and the hawks and owls are wonderful rodent control. Just not if those rodents are poisoned! Oh Please take action on both of these frontiers. The birds are counting on you.